This is my 5th Bear, Elliot. I decided to try double knitting him, but wasn't really able to dk the entire body because of need to leave holes for the arm placement. I made the sweater using red heart "crayon" self striping yarn, but wasn't thinking it through completely because I had to dig into the ball of yarn to get two strands the same to knit him up so the front and back would be the same; however, this caused a more striped look than the "pattern" that the yarn is supposed to make. 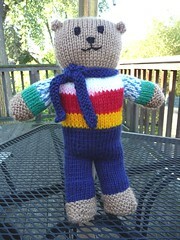 He is also larger than the bears knit on dpns or knit flat and seamed.